Last Saturday we picked up our first Cropthorne Farm CSA share at the opening of this season’s Winter Market. What did we get? That’s a whole lotta veggies! I’m excited to get cooking! It’s been a long time since I’ve been here and it has only solidified the fact that I just don’t have writing stick-to-it. I’ve seen myself notoriously start and stop on far too many of these kind of projects. It seems that if I don’t have a reason to blog, I just won’t. Not only am I notorious for dropping the blogging ball, I’m embarrassed to say that I am also notorious for letting produce sit in the fridge and rot. I will buy, pick or receive vegetables, lose track of them and when I dig them out of the depths of the fridge, they’re too far gone to salvage and eat. So this poses a challenge for the next while. 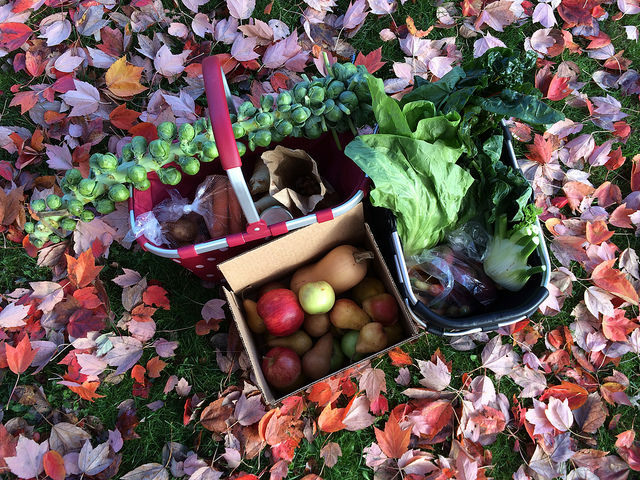 We have signed up for a weekly winter CSA through Cropthorne Farm in Delta, BC. We participated in the farm’s CSA’s last winter and summer and we split the share so we received produce every other week. This season we’re taking on the whole share and we’ll be receiving a lucky dip of produce every week for 8 weeks. This is going to be quite the commitment because it’s a substantial amount of veggies and we usually end up buying others that are appealing. So I’m going to tackle these two notorious traits (haha…I’m notorious for many more things, but here’s not the place to discuss them): I’m going to embark on an 8-week project where I’ll write about our winter CSA adventures. I’ll include what we receive, what I’ve done with the produce, recipes, impressions and hopefully, many other tasty morsels. I’ll also get to expand my repertoire of vegetable cookery, have a dialogue with you about eating seasonally, eat more vegetables and feel good about decreasing wastage. And if I should get myself motivated to blog on a regular basis on the long term, I will be the more pleased. That sounds like a delicious reason to blog.